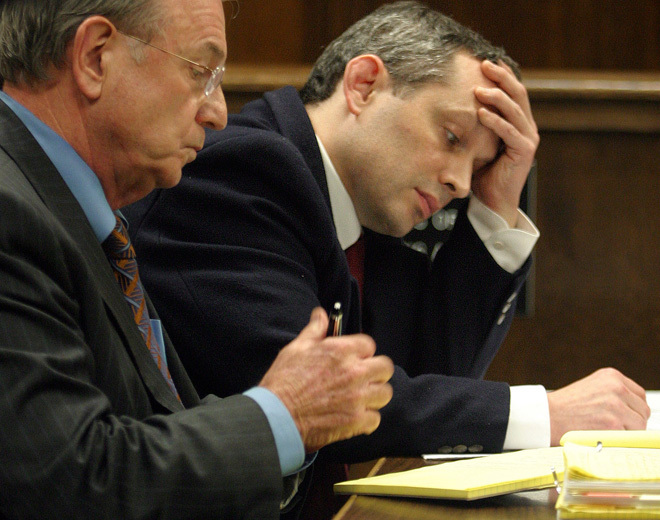 Defense attorney William DuBois, left, and defendant Hans Reiser in court in 2007. Linux programmer Hans Reiser, who in 2008 was found guilty of murdering his estranged wife in Oakland, California, is going to federal court to demand a new trial, claiming his attorney forced him to take the stand against his will. The murder case, in which Reiser ultimately received a 15-to-life sentence, began with no body, no crime scene, no reliable eyewitness and virtually no physical evidence. It ended with Reiser convicted of killing Nina, his 31-year-old wife, after he took the stand and proceeded to slowly hang himself over the course of 11 days of testimony. In a rambling, 117-page handwritten civil rights lawsuit penned from Mule Creek State Prison, Reiser — legendary in Silicon Valley as the creator of the ReiserFS file system — attacked his lawyer, the credibility of witnesses and even the trial judge. In seeking unspecified financial damages that “are large compared to the troubled state budget,” Reiser said he could not get a fair trial because the “hive mind” of the state’s judicial system suffers from a collective mental illness. Reiser’s core allegation concerns the fateful strategic decision that ultimately sank Reiser at his murder trial: the decision that Reiser should take the stand and testify in his own defense. Wired.com, which covered the case gavel to gavel, and others including the San Francisco Chronicle, reported during the case that it was Reiser’s decision to testify, and he did so against the wishes of William DuBois, his veteran criminal defense attorney. 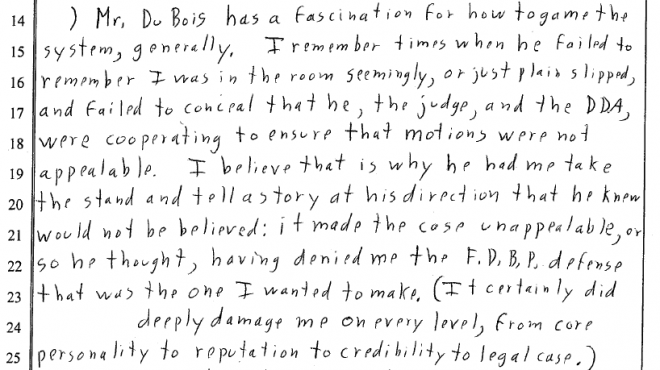 Reiser says that DuBois made him testify, in an attempt to derail any chance of a successful appeal. “I believe that is why he had me take the stand and tell a story at his direction that he knew would not be believed,” (.pdf) Reiser wrote. DuBois, in a telephone interview, said that was untrue. 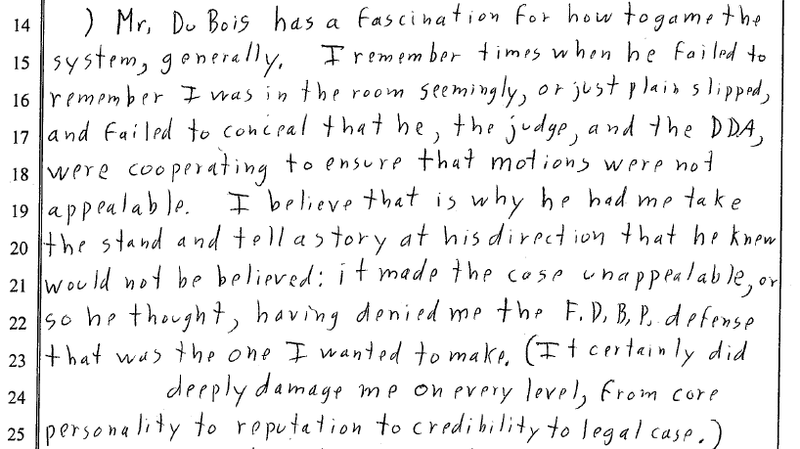 Reiser’s testimony was “terrible,” DuBois added. During his six-month trial, Reiser and DuBois had argued to jurors that Nina Reiser was not dead, that she had abandoned the couple’s two young children to sneak away to Russia where the couple met in 1998. Reiser also testified that she fled because she was embezzling from his software company, Namesys. By the time Alameda County, California prosecutors rested their case, they had called some 60 witnesses but presented mostly circumstantial evidence demonstrating animus between Reiser and his wife, and suspicious behavior by the defendant following Nina’s disappearance in September, 2006. The turning point in the trial came when Reiser took the stand. He offered lengthy and verbose explanations for every piece of circumstantial evidence. But Reiser’s version of events often drew disbelieving head shakes from jurors — and occasional smirks from the trial judge. When Reiser was testifying why he had removed and discarded the passenger seat from his two-seater Honda CRX after Nina vanished, he said he’d been sleeping in the vehicle, and wanted the extra room. Asked by the prosecution why he hosed down the inside of the car, leaving an inch of water on the floorboard, he explained that the interior was dirty, and he mistakenly believed the water would drain out. The courts are loath to grant new trials based on trial-strategy decisions, meaning Reiser’s chances of success are slim. Theodore Kaczynski, the Unabomber, had asked for a new trial, claiming he was coerced into pleading guilty to three fatal mail bombings rather than have his mental condition come into play. In 2001, a federal appeals court rejected Kaczynski’s claim. Reiser also argues in his filing that his murder trial should have been held in federal court. He said his battles over his divorce, custody of his two young children and child support created the “conditions” for him to commit murder. “I ask this court to find that where a defendant has established a history of futile complaints prior to killing someone, the state courts should not be the ones to determine if their non-response to the complaint, violations of civil rights, retaliation, and suppression of evidence of their violations of civil rights that amounted to aiding and abetting of felony child abuse, caused a death, by creating condtions that justified an otherwise unnecessary and avoidable homicide,” he wrote. During the trial, he complained that Nina got more custody of their two young children because she made up allegations that they suffered from Post Traumatic Stress Disorder because Hans Reiser allowed them to play violent video games. Ahead of trial, Reiser was offered a three-year deal if he led police to the location where he dumped his wife’s body. In his filing, he said he didn’t want to go to prison and wanted to fight the charges so he could ultimately regain custody. “I declined the deal as immorally placing my welfare above the safety of a child that I was responsible for the safety of,” he wrote. Three months after being convicted, Reiser led Oakland police to his wife’s body in the Oakland hills in a post-conviction deal with prosecutors and the trial judge. DuBois negotiated a 15-to-life sentence instead of the normal 25-to-life term. 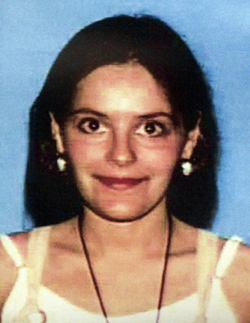 Nina Reiser, 31, was found in a shallow grave outside an Oakland park, about a half mile from where she was last seen in 2006 at her husband’s house. The Reiser children are living with Nina’s mother in Russia. The rest of Reiser’s filing is here, here, here and here.